Malak, 25 years old, is Business Development Manager at Factorial. But what does this means exactly ? Malak is the first person to get in contact with the clients, and this is the most important part because this is where the value proposals is transmitted to the clients. 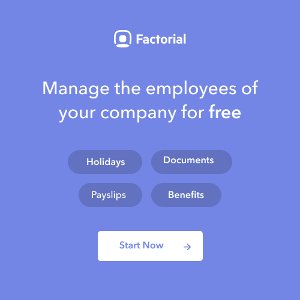 During this first contact, the client does not necessarily know what Factorial does, so this is the opportunity for him to discuss what we do and how we do it. It also includes trying to understand the client’s needs and to find a fit between what we can offer and his needs. Malak was living in Valencia when he heard about Factorial. 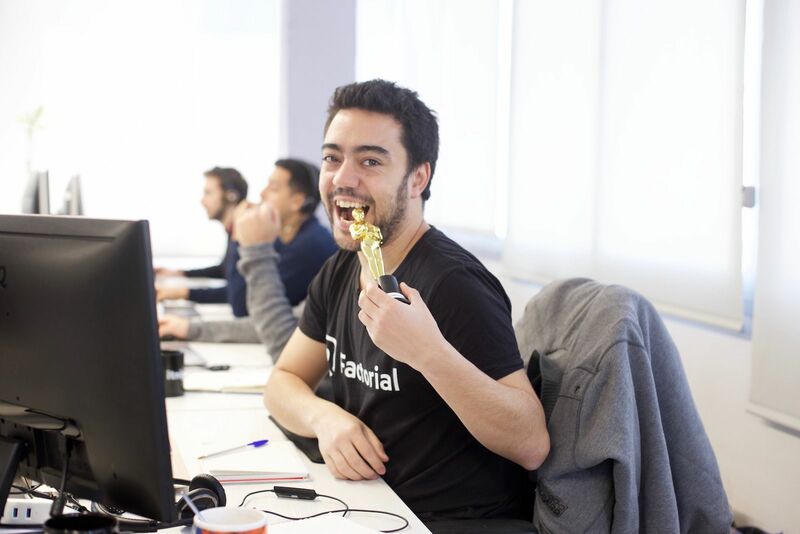 He found the project really interesting and thought it to be a big opportunity to grow, this is why he applied for it and started then as an SDR (Sales Development Representative) in Factorial one year and a half ago. Since the team has been growing quickly, he started managing the team and doing some account management roles. For example, by doing some demos, he shows to the potential users how the software works and how it can fulfill their needs. Once the demo is done, he closes the account into real sales, and announces the good news to his colleagues with the help of a “Gong”. 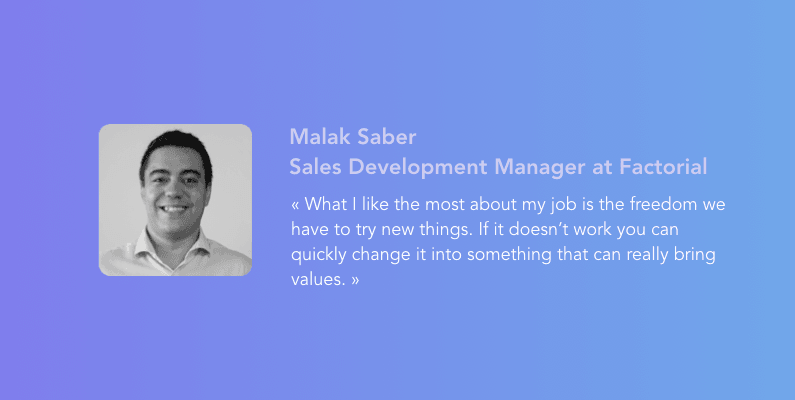 When being asked what he likes most in his job, Malak explains how autonomy and freedom can bring value to your business. Employees have the opportunity to try different things every day and see what works and what doesn’t. They can change very quickly from one point to another and this is really helpful for the business, if something doesn’t work, you can change it into something that can really bring values. But there is another thing Malak likes about his job. First, the chill place and the ping-pong room, of course but, more importantly, the people he is sharing his days with. According to him, it is very important to feel comfortable and at home at work. And he experiences this every day thanks to the very united crew he’s working with: “we are a family to each other”. This atmosphere allows them to do “whatever we can to keep growing and to do the best we can”. All his best memories at work are with his colleagues, such as going out and having dinner, doing a barbecue, grabbing some beers and spending time together. This is probably one of the reasons why when being asked “What is your favorite moment of the day?”, Malak answered “The whole day is my favorite moment”. Get to know Malak better, guess what ? Yes, believe us, Malak speaks spanish, english, french and arabic fluently. He also speaks polish, catalan and italian. Eventually, the last thing you need to know about Malak is that he won an Oscar last friday at the Oscar’s Itnig Party, namely “the more sociable person of the office ». Willing to experience a similar journey ?